Most tourists coming to the Arctic really like to see Polar Bears. Walruses are less attractive, but are still high on everybody’s wish list. In contrast to Polar Bears, Walruses are often very easy to find. They use the same beaches year after year as haul out places. Visit one of these beaches and you’re almost guaranteed to see Walruses on land. This cruise turned out to be different. This Walrus already showed up on the second day, on sea ice just outside Isfjord (a place which normally is free of ice in summer). However, it was just there for a minute or so and then it rolled from his ice floe into the water. The first haul out beach was covered in fog, so we couldn’t see anything there. The second place was surrounded by dense pack ice, so inaccessible for us. And the last beach was empty, probably due to a cold wind directly on the beach. 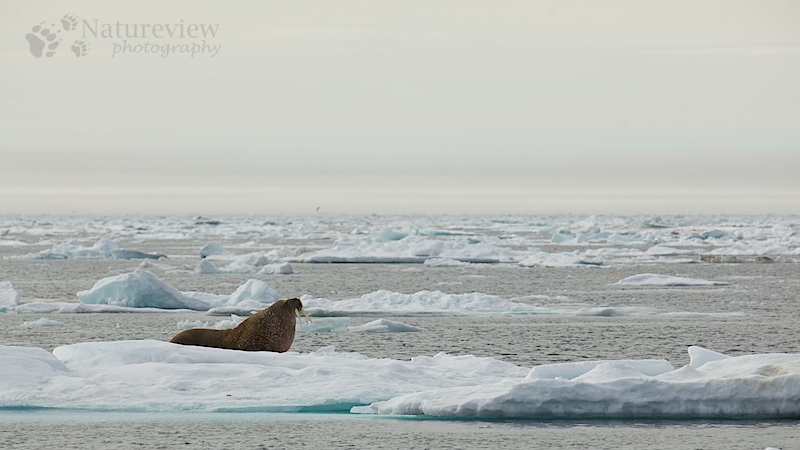 In the end, the brief view of the Walrus in this picture turned out to be our best Walrus (with of course the large group at 200m at Moffen island).